I made this card with all of you in mind, our High Hopes Fans, my fellow design team members and blog followers. I coloured my card with alcohol markers and hand fussy cut it. 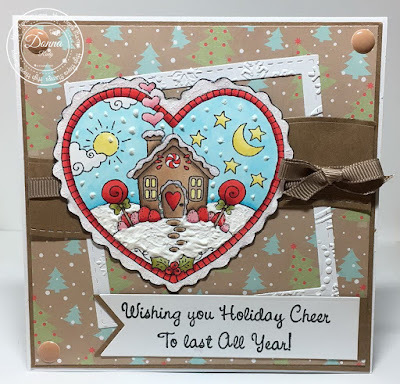 I love some bling and glitter on my Christmas cards so I added some glittery snow and Nuvo glitter drops to the "yard", house and sky. I cut out a fun frame totally by accident to be honest but that is a story for another day and added it behind my image. The sentiment was stamped and cut out using a fish tail banner die. 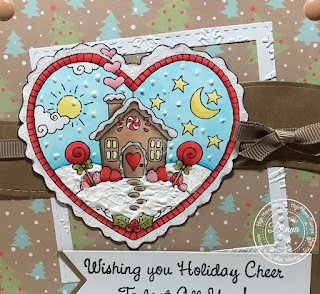 Some matching ribbon and my favourite - gumdrops - finish off my card. Adorable card and your colouring is awesome! Wishing you Holiday cheer to last all year too my talented friend!